We speak to 100s of project-based businesses every day. 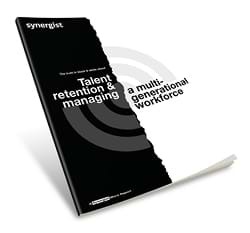 Retaining talent in a workplace of hugely diverse generations is a topic we hear very often. We hope this micro report will give you some pointers in managing the situation. Let's start by defining the generations. Born before the-mid 1940’s, this is the oldest living generation still active in the workforce. Influenced by the Great Depression and World War 2, they are tend to be conservative, disciplined, and have a strict adherence to the rules and a strong sense of duty. Born from the mid-1940’s to the mid 1960’s, the boomers tend to have a post-World War II optimism inspiring a sense of stability, opportunity and prosperity. Gen X were born from the mid-1960’s to the early 1980’s in the lull following the baby boom, and are called the “lost” or “middle child” generation for being fewer in numbers and less prominent. They grew up at a time when divorce rates reached a new high, and many had two working parents, making this generation largely independent. Millennials were born from the early 80’s to the early 2000’s. This generation grew up at a time marked by the arrival of the internet. Children of the Baby Boomers, many grew up with close supervision and abundant, optimistic, parental support of their goals. This is the youngest generation currently entering the workforce. Born in the early 2000’s, they have been connected their whole lives, making them even more technologically savvy than their predecessors. "Coming together is a beginning, staying together is progress, and working together is a success." Today’s workforce is made up of an unprecedented mixture of generations working side-by-side. Due in part to the rising average age of retirement for the first time in history, five generations are working together. This means that organisations are tasked with managing an employee base that spans more than 50 years. At the same time, the rapid pace of technological change is shifting how people communicate at work, which skills are in-demand, and the perception of work-life balance. The result is a workforce in flux. Let’s take an average workforce of 18 - 60 year olds. You’ve got a generation who were born when ‘Mac the knife’ was number one and Ben-Hur was reigning supreme at the cinema, trying to work alongside a generation of ‘digital natives’ who’ve been ‘connected’ since birth. Surely this is an issue that’s been prevalent in all businesses great and small since the beginning of time? Yes, but it’s the environment in which the generations grew up and evolved that has extensively exacerbated the issue. How on earth can you expect such polarising experiences to seamlessly gel and produce a cohesive, optimally-functioning team? Opportunities for tensions at work may arise when you mix generations. It's not unusual to have a 20 year old sitting next to a 50 year old, completing the same work. Likewise, it's now commonplace for older employees to be supervised by significantly younger individuals. Key stakeholders, decision makers and people of influence in the buying process are getting younger and for organisational leaders, fostering healthy work relationships across many age groups in this environment presents unique challenges, but offers tremendous opportunity. Generational diversity, like any diversity, brings a variety of experience, skillsets, personalities, observations and creativity to an organisation, allowing its teams to better address challenges and come up with innovative solutions. You gain business-savvy and new skills. It’s true, there is no substitute for experience, but similarly, there is huge merit to the younger, hungry generation who come bearing fresh ideas and a tech perspective that can only be achieved as a digital native. So as a business owner or team leader you can’t ignore the benefits that come with a multi-generational team. 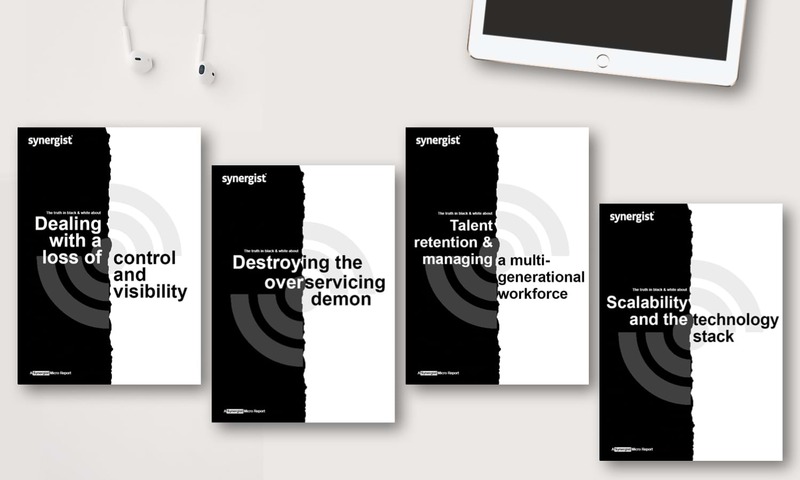 Rather than stereotype, this report highlights some of the proven common differences between these generations in terms of attitudes towards work and company, arming you with insights to help retain a harmonious and productive multi-generational workforce. [The Boston College Centre for Work and Families in TechRepublic]. • Baby Boomers complain that Generation X and Millennials lack discipline, focus, and are distracted. They also think Millennials lack commitment. • Gen Xers complain that Baby Boomers display resistant/dogmatic thinking and are sexist, defensive, incompetent, resistant to change, and lack creativity. They believe that Millennials are arrogant. • Millennials complain that Baby Boomers display resistant/dogmatic thinking, and are sexist, defensive, insensitive, slow to respond, resistant to change, incompetent, and lack creativity. They also believe Gen Xers have poor problem-solving skills and are generally slow to respond. Out of all the generations, the ones that have the hardest time working together are Baby Boomers and Millennials, according to the survey. The good news is that these problems are more about communication than they are about age, and they can be overcome. Stop talking about generational differences. Your management goal should be about working with individuals, not talking about those individuals' ages. Doing so will make the age gap less important to your team and help remove related stigmas. Instead, your employees can place their focus elsewhere, like on working as a cohesive group. Encourage everyone, from company leaders and employees—to embrace what they share, not what divides them. Not only does this build collaboration, but it also helps build trust across generations. You might be surprised at how much commonality exists between generations. Younger and older employees can mentor one another in unique ways. Generation Z was weaned on technology; a member of that group may be the perfect go-to person for general internet- or smartphone-related questions. Similarly, a Gen X-er or Baby Boomer might be able to give significant insight on career growth based on his or her wealth of expertise. In creative industries, growing up in a world of print can bring a whole new perspective to a piece of online creative. When planning project staffing, try to mix and match employees of all generations based on the unique skill sets they bring to the table. The more chances they have to broaden their horizons, the less the age differences will matter. It's OK to manage people differently based on their goals, abilities, and strengths, as long as you stay within human resources parameters. Evaluate employees based on who they are, not based on the generation they belong to. Every employee will do better at work if they feel a sense of purpose. Baby Boomers are very loyal and will therefore appreciate a strong company vision that they can buy into and understand their role within. At the other end of the scale, Generation Y and Z, who are thought to lack loyalty, need something outside pay to bind them to a company. If your vision includes all generations and your values include respect and inclusion, then this will naturally encourage collaboration. "Provide purpose and promote passion. The Why matters more than the what." It would be remiss of us not to mention this. When asked to consider potential sticking points of a multi-generational workforce, technology is almost certainly the first thing that springs to mind. How can a generation that stereotypically doesn’t engage well with new technology work harmoniously alongside digital natives, who don’t know a world without it and could even consider making a career move based on the technology offered? For some industries, this may not be an issue, but we’re struggling to think of an industry that hasn’t been or shouldn’t be disrupted by technology. You can understand how this could be the main driver for conflict. Not only do you need to be able to recruit and retain digital natives if you want to stay on top of the tech game, but how do you plan your internal technology stack so both digital natives and the older generation can enjoy using the same system(s) daily? So different generations have varying preferences when it comes to communication. It’s likely that the older generation prefer phone calls and perhaps email, whereas the younger generation may prefer instant messaging. Is it an issue that some people like using the phone and some prefer email/messaging? Give people the opportunity to communicate how they like and embrace the merits of each. Offer training to all staff on technology used and be clear about the benefits and reasons for selection. Consider all team members when deciding on new tech. Will it benefit the whole team? Keep it simple. This isn’t only a generational issue but if you are working in a non-tech role and you’re expected to use complicated systems on a daily basis then that’s not going to gel. And of course implementing a comprehensive project management system increases cohesion because it delivers a smart and efficient way of doing things. A generation that liked using endless spreadsheets or complex whiteboards realises that one unified system, accessible from anywhere at any time, pulls everything together in a way that prevents things falling through the cracks and gives is a transparent process that everybody benefits from. This further nurtures the collaboration mentality. Any atmosphere of prejudice can be reduced when people work together, get to know each other’s involvement in the process, and understand each project’s priorities. This benefit has often been reported to us by businesses implementing Synergist, as is the reduction of individual isolation, us-and-them bias and information silos. Seeing the big picture, often for the first time in their career, gently nudges an individual to see how they and their colleagues fit in together. "Boomer and Gen X parents have taught their millennial and Gen Z children to be confident, that they are special and to not settle. Ironically, Boomer and Gen X bosses label this confidence as ‘narcissistic’ and ‘entitled’." [Huffington Post, 27 Oct 2017]. And she’s not wrong. For 1950 -1970s a job for life was expected. Job hopping raised a red flag and the notion of a stepping-stone job simply didn’t exist. Progression was earnt internally through promotions and pay reviews. The notion that jobs have become disposable to the younger generation is a real problem. A recent study quoted in TIME magazine US showed that 40% (of millennials) believe they should be promoted every two years, regardless of performance. This could explain why another study carried out by PayScale showed that millennials only stick with the same job for an average of two years. Happiness-drivers such as purpose, praise and appreciation are fundamental, regardless of age. All employees want to be rewarded for a job well done and to feel they’re headed in the right direction career-wise. But what constitutes as career development to Baby Boomers will vary from Generation Z. As mentioned, Generation Z think nothing of moving on to a new role if opportunities are not presenting themselves or presenting themselves quickly enough. Whereas for people born 1950 – 1970, career progression within the company is normal and expected. Either way, what’s highlighted is that it’s imperative to all generations that opportunities are present and that good work is acknowledged. How this is approached, however, may be different across generations. Generations X, Y and Z tend to be less receptive to an authoritarian style of leadership, and generally prefer frequent and immediate feedback. Baby Boomers are likely to feel it carries more weight if feedback is formal and planned. With younger generations, it’s not the case that the employer holds all the cards. They’re demanding more and they’re voting with their feet. This shifting attitude towards work among Generation Y and Z, coupled with the loyal nature of the Baby Boomers, makes it tempting to direct your benefits package towards the young folk. But then you’re alienating your loyal core, the very people who will hold your business together in the event of a mass exodus. A loyal, experienced section of your workforce is not to be ignored. So how do you juggle this when what constitutes a benefit is likely to vary wildly across these generations? For example, unlimited holiday is something that’s becoming more commonplace among fast-growing tech start-ups. Would this be a benefit to the older generation or would they find it frankly ridiculous and more-than-a-little confusing? Matt Smith, CEO at marketing agency BDB, recently conducted a survey among his employees to help him devise a benefits package to suit his multi-generational workforce. 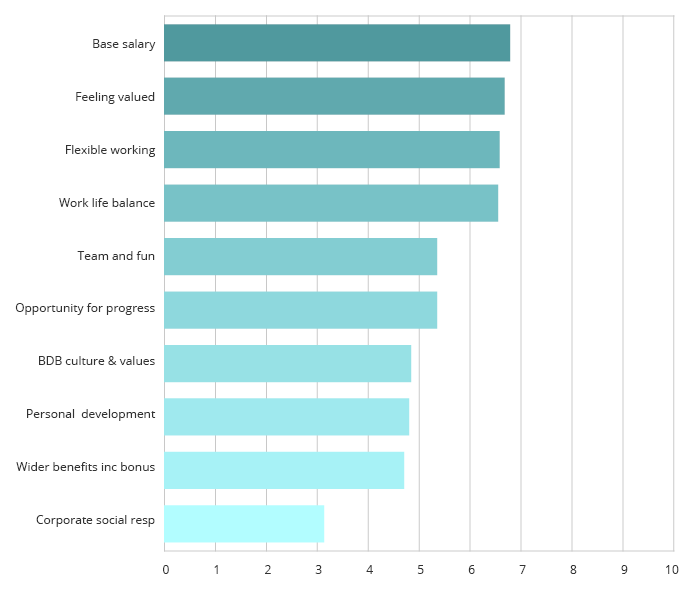 “Rather than guessing or making the mistake of shaping a remuneration and benefits structure that we as business leaders personally valued, we surveyed every member of the team at BDB and asked them to rank the options below from most (1) to least (10) important to them and their career. "I found the results quite illuminating. It feels like we are constantly being told that employees aren’t financially motivated anymore and instead are looking for empowerment, freedom and wellness initiatives coupled with a solid charitable drive at the corporate level. "I would argue if you want to attract and retain the very best talent available, offering a market-leading salary is now considered a table stake as opposed to it being a point of differentiation as it has been in the past. "Whilst I appreciate all areas listed aren’t mutually exclusive and we were encouraging a ranked result, it certainly shape the BDB Choices Employee Benefits Suite we now offer our team including the bold introduction of unlimited holidays and flexible working. Watch ‘Wolf of Wall Street’ and you’ll be surprised if ‘ethics’ was on anyone’s list of credentials in the 80s. Fast-forward to a world where it’s predicted that in just 31 years there will be more plastic in the ocean than fish by weight and ethics becomes a key driver for the younger generations. A plethora of ethical consumer brands started springing up and thriving. There is now a generation that has always known The Body Shop, yet they are savvy enough to be suspicious about a once ethical brand being acquired by a large group, and by differences between being ‘against animal testing’ and outright saying they don’t test on animals. Veganism has Skyrocketed in recent years with 3.5 million vegans in the UK compared to 540,000 in 2016 (source: The Vegan Society). And this figure is only growing. These figures were specifically in relation to attitude towards consumer brands, but it stands to reason that if they care, they care and would not want to work for an unethical company, in the same sense that they don’t want to buy from one. This report highlights the differences between generations. If you want to talk emotionally-intelligently to all your employees then it’s worth taking some time to understand these and consider how you can personally communicate better with your different team members. How you can encourage your team to understand what they can learn from each-other, and what you can put in place to enhance productive multi-generational working. But ultimately, whilst there is solid evidence of common generational differences, there’s a multitude of other differences across your workforce that have nothing to do with age. Having an inclusive vision, nurturing career paths and fair pay will naturally serve to ease multi-generational tensions. If you seed a culture of respect, inclusion and collaboration that starts from the top, then your team will be skill-sharing on a daily basis to the benefit of your business.